You've probably seen photos and video of overarmed police officers facing off against unarmed protestors in Ferguson, Missouri . The view of soldier-cops with assault rifles riding on top of mineproof tanks is certainly excessive, but also surprisingly common. How did we get here? The revelation that police officers look more and more like soldiers in America is not a new one, but the events in Ferguson serve as a visceral reminder of how some potentially misguided policies have given our local law enforcement agencies weaponry that would be more at home in a foxhole than a cul-de-sac. 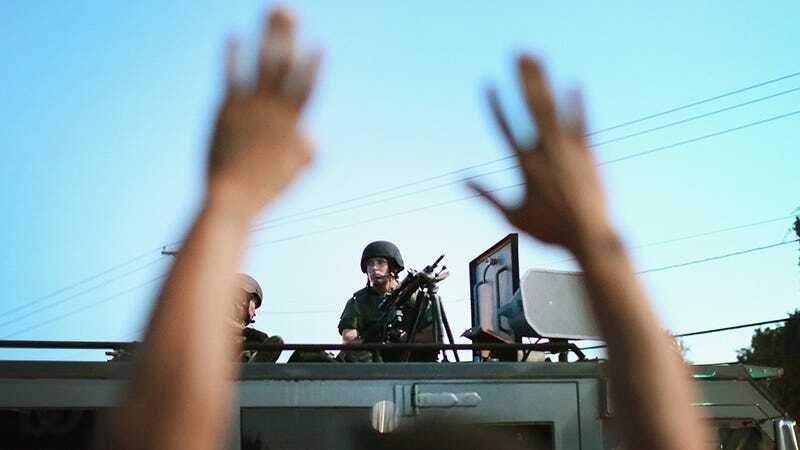 The militarization of Ferguson—and countless municipalities like it—is the result of process that kicked off in the 1990s, when crime rates spiked and Congress made it easy for the Department of Defense to transfer excess equipment to local police forces. The part of the National Defense Authorization Act this new policy affected is now known as Section 1033. The initial intent of Section 1033 was to help police go to war against violent drug gangs and terrorists. But a glut of Bearcats and battering rams and anything else you'd find in an armory after Iraq and Afghanistan than they knew what to do with. So the program expanded to include local police forces that didn't have any demonstrable use for the equipment, but who also weren't going to say no to a very expensive handout from Uncle Sam—free of charge. As far as what exactly Ferguson has at its disposal, it's hard to say. In an investigation of recent city budgets, it's easy to find appropriations for new laptops in squad cars and high tech parking ticket printers. Details about how the local police got their hands on the Bearcat armored vehicles and the LRAD sound canon you're hearing in apocalyptic YouTube videos, however, are scarce. We also may never know the full extent of procurements in Ferguson or elsewhere. As Newsweek pointed out earlier today, "1033 procurements are not matters of public record." The magazine did manage to track down a list of purchases made by St. Louis Country law enforcement agencies through the 1033 program, but there are glaring omissions, namely those badass Bearcats. It's certainly possible that the police bought the gear with funds from the Department of Homeland Security, which has played a major role in militarizing local police forces. But again, the records are not easily accessible. Cannons and tank-like vehicles are the most outsized investments, but the escalation of equipment has occurred on a smaller scale as well. More than one combat veteran has pointed out how the officers on the streets of Ferguson are more heavily armed than they were when they went into battle in Iraq and Afghanistan. The latest photos from the front lines of the protest actually show officers toting short-barreled 5.56-millimeter designed after the military's M4 carbine. These cops are wearing war-ready camouflage, flak jackets, and helmets with ventilators , walking down American streets in combat boots, and pointing their weapons at innocent bystanders with their hands held high. In an attempt to get more information on the police forces' military gear, we called no fewer than six numbers at the Ferguson and the St. Louis County police departments, but no one would go on the record. The St. Louis County police website was also down, probably due to the recent attack by Anonymous. 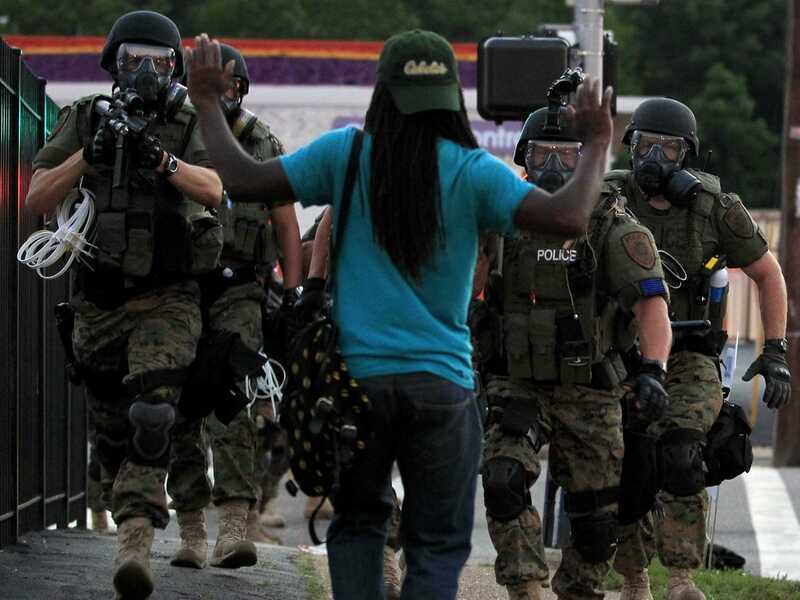 Even if the situation in Ferguson calms down in the next few days—far from guaranteed—the militarization of America's police forces will only ramp up. This year, the military gave local law enforcement $752 million in surplus gear—the most it's even given away. Again, the government just gives the gear to them for free. That number represents an increase of over 50 percent from the less than $500 million in surplus gear donated in 2013. Keep in mind that the number of reported crimes is down year-over-year. In fact, that number is roughly 50 percent of what it was in 1990. Local law enforcement should be well-equipped; no one can argue with that. They're responsible for protecting hundreds of millions of people from myriad threats, many of which necessitate forceful response. When the line blurs between police force militia, though, it's hard to argue that anyone feels—or is—safer.